Those feral powers made Jack Carver one mean action hero in this game. 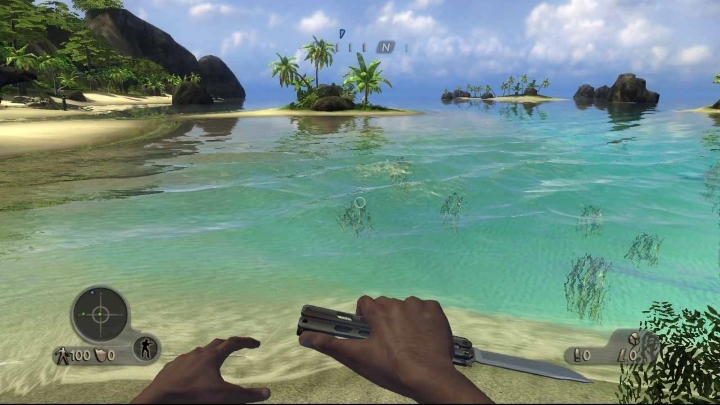 This game was basically an Xbox 360 version of the Far Cry Instincts game, and it also included the single-player campaign from the game’s semi-sequel Far Cry Instincts Evolution. Predator was something of a mixed bag when it came to visuals though, as the character models were a bit rough around the edges like those of the original Xbox game, even though it had higher resolution graphics than the earlier Xbox game. But still, this game let Xbox 360 owners enjoy the great gameplay of the original Xbox game. And the action was as great as ever, as former navy commando Jack Carver could either kill his enemies stealthily using his feral powers (which he gained when he was captured by a mad scientist villain an injected with a mystery serum) or choose a less subtle approach and storm enemy positions, guns blazing. Either way, the game was a blast, and let players play action movie hero in a tropical paradise.